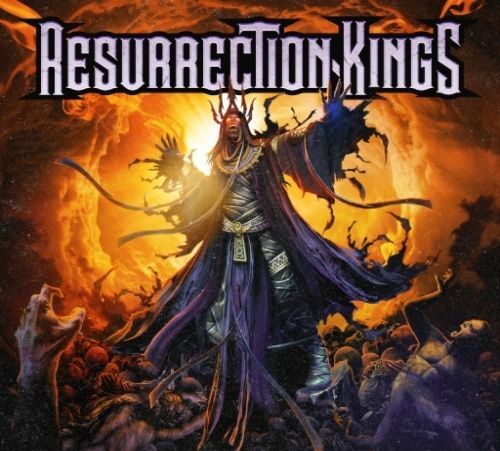 The self-titled “Resurrection Kings” is my third album recommendation for a Frontiers Records release dated 29th January – following on from Primal Fear and Nordic Union. Like the latter, this is another of those rock collaboration projects at which Frontiers excels. Some of those collaborations never get beyond the studio, but when I spoke to guitarist Craig Goldy on the Friday NI Rocks Show on 29th January (http://www.rockradioni.co.uk/interviews/2459-ni-rocks-interview-with-craig-goldy-dio-resurrection-kings-etc.html ) he certainly hoped to get the band out on tour and get another album recorded. Joining former Giuffria and Dio guitarist Craig Goldy is vocalist Chas West who has worked with bands such as Foreigner and Lynch Mob in the past and who had been writing with Goldy for a few years. Sean McNabb from Lynch Mob, Dokken and Quiet Riot plays bass and Goldy’s Dio bandmate Vinny Appice plays drums. Completing the line-up on the album is Alessandro Del Vecchio who played keyboards, as well as co-writing with Goldy and producing the album. Craig Goldy selected “Livin Out Loud”, “Fallin For You” and “Who Do You Run To” as the tracks to play on the Friday NI Rocks Show on 29th January. All 11 tracks on “Resurrection Kings” are great, but other favourites would be “Distant Prayer” and “Had Enough”.